The balancing machines from Hofmann are designed according to customer-specific requirements. 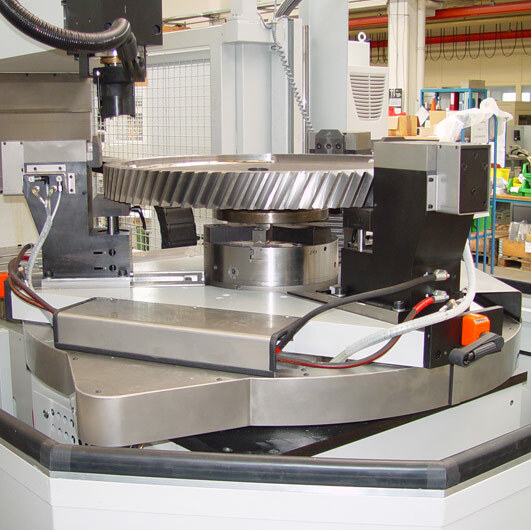 We can provide machines that solely measure unbalance or combination systems that include a specially developed milling unit. 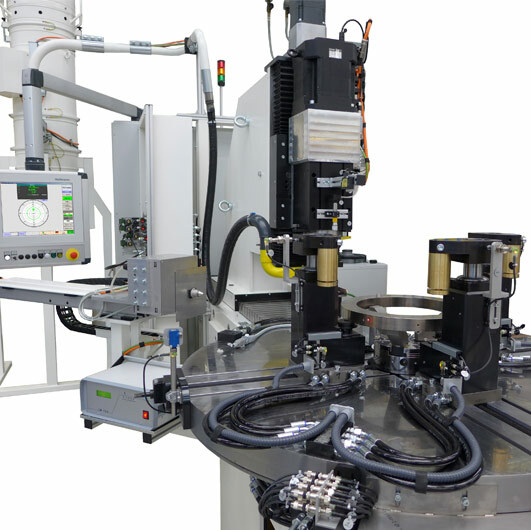 In order to limit installation restrictions as much as possible, Hofmann’s vertical balancing machines for single components like railroad wheels, brake disks or ring gears are designed as soft-bearing machines. The main advantage of this concept is the reduction of disturbances like floor vibrations, or vibrations caused by neighboring machines. As a result, the addition of a complex, costly foundation can be avoided. 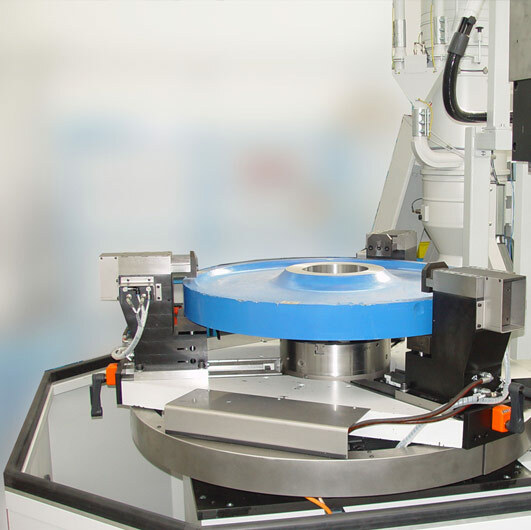 Depending on the customer specification, these machines can be designed solely as unbalance measuring machines, or they can be combined with a specially developed milling machine. 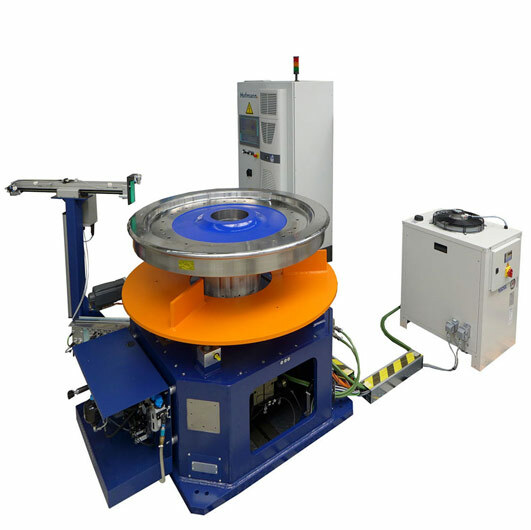 Various machine concepts are available for balancing the brake disks of rail vehicles. From the universal machine, which provides measurement values used to correct unbalance on a separate machine, to combination machines that both measure and correct unbalance in one station. In the combined machine concept, the workpiece is indexed to the calculated correction angle after unbalance is determined. The workpiece is then clamped by a specially designed clamping table and the unbalance is corrected. Loading may be manual by crane or automated by robot or loading gantry. 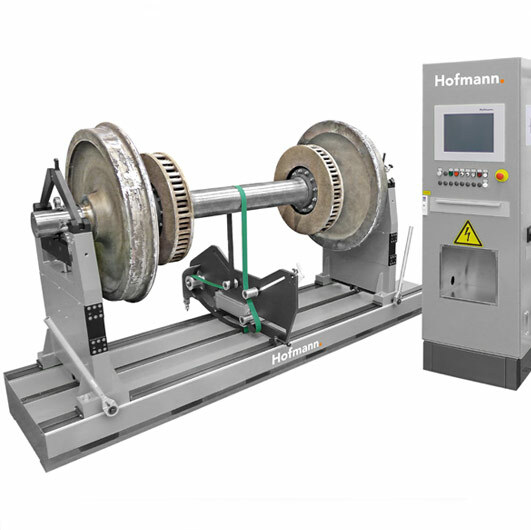 For the balancing of rail vehicle wheels, Hofmann offers universal machines that measure the unbalance (which is then corrected in a separate machine), as well as combined solutions where unbalance measurement and correction is integrated in one station. In the combined machine concept, the workpiece is indexed to the calculated correction angle after unbalance is determined. The workpiece is then clamped by a specially designed clamping table and the unbalance is corrected. Loading may be manual by crane or automated by robot or loading gantry. For the balancing of rail vehicle ring gears, Hofmann offers universal machines that measure the unbalance (which is then corrected in a separate machine), as well as combined solutions where unbalance measurement and correction is integrated in one station. In the combined machine concept, the workpiece is indexed to the calculated correction angle after unbalance is determined. The workpiece is then clamped by a specially designed clamping table and the unbalance is corrected. The type H-24 universal machine is used to measure the unbalance of rail vehicle wheel sets in two planes. Depending on the customer specification, the drive type may be a belt drive or a drive shaft. The correction parameters (milling cut length per correction plane) can be transmitted to a separate processing machine via interface (to be defined based on customer requirement). Loading may be manual by crane or automated by robot or loading gantry.